The third installment of the Inu-Yasha movie series is out now, and unlike the first two movies, this one adds something to the main story of the TV show that fans will really want to see. With each successive Inu-Yasha movie, the story has become deeper, but it has also managed to alienate itself more and more from outsiders to the series. Although Inu-Yasha is a polarizing show (i.e. you will love it or hate it), the first movie, Affections Touching Across Time could be enjoyed by fans and non-fans of the series alike. You could just pick it up and watch it without having seen any of the series. However, the second movie, The Castle Beyond the Looking Glass could only be appreciated by Inu-Yasha fans, due to a few key scenes. The third movie tailors even more so to the Inu-Yasha fan base. Inu-Yasha: Swords of an Honorable Ruler features a third sword that Inu-Yasha's father possessed. As most fans know, Inu-Yasha received the Tetsusaiga, while Sesshomaru received the Tenseiga, but the third sword, Sounga was sealed away, intended for no one to use. Somehow, it ends up in the hands of Kagome's family (probably so that they can make a cameo appearance), and it awakens. The reason that the Sounga was sealed away is not only due to its immense power, but also due to its great thirst for blood and power. Now it’s up to Inu-Yasha to try to seal it away, but he'll need help from a very unlikely ally. The best part of Swords of an Honorable Ruler, and what makes it stand out from the previous two movies is the fact that it actually tells more about the history of Inu-Yasha and Sesshomaru. Additionally, for the first time ever, their father plays a role in the story. 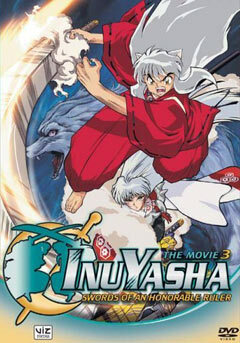 This movie fills in the holes in the Inu-Yasha series, thus it is one that fans won’t want to miss out on. Fans are treated to seeing Inu-Yasha’s mother being on screen as well, after getting only a few fleeting glimpses in the TV show. Anyone who’s seen the series will love knowing about Inu-Yasha’s mother and father. Swords of an Honorable Ruler is more than just an extended TV episode. For fans of Sesshomaru, you’re in for a treat, because this movie is loaded with him. Sesshomaru has a larger role in this movie, while Miroku and Sango seemed to be pushed to the side as minor support characters. There are a few nice additions to the cast, as Rin and Totosai get a good amount of screen time, and the main villain, the Keeper of the Sword is a solid character. As in the first two movies, you get an action heavy movie. However, unlike the first two films, there isn’t quite as much of a focus on the romance. The action scenes are well done, and there’s even a sword fight in a bamboo jungle. Cha-Ching! Swords of an Honorable Ruler does have its faults, however, as you have moments that stand out as just corny. The one scene with the screen dividing into four, with every character giving their support is a bit tacky, and Kagome's ‘can-do’ attitude might grind a little on some people. What could be the most disappointing is the ending. Although I've seen far worse, it just leaves you with an almost indifferent feeling. Even the credit cookie wasn't as satisfying as usual. The step-up in animation is obvious once again, as the movie looks good, but it isn't the best looking out movie of the three so far. There are some lapses in the CG from time to time, but it’s not noticeable enough to make it a major problem. If you've been watching the Inu-Yasha movies, then you already know about the slightly different character designs, which return here once again. In the sound department, you get the usual Inu-Yasha fare of nice background music that fits the show to a tee, and which compliments all of the scenes that it's used in. The ending themes of Inu-Yasha, whether in the movies or the TV series, have been some of the best in anime, and Swords of an Honorable Ruler contains another nice closing number. As far as voice acting is concerned, you're getting one of the better casts out there in both English and Japanese. Watch this movie either way, because both are well done. Perhaps I'm easily amused by shinny things, but I've enjoyed the glossy, metallic covers of all of the Inu-Yasha movies. It's a nice touch to make it stand out from the dozens of other DVDs that consist of the collected TV show. It's also nice to see some good extras in here, which include a line-art gallery, Japanese promos for the movie, a small trailer for the fourth movie, and special footage. The special footage included is a nice touch, as it consists of clips from all of the TV episodes that are required to understand the movie, mainly information on the two brothers' swords and Sesshomaru. On top of the DVD extras, you get the movie soundtrack and a card for the card game. It was nice to see these two small bonuses, but I do have one minor problem. The music for Inu-Yasha works great in the show, and I really enjoy listening to it, but it's not the kind of music that you would just pop in your CD player and listen to. Having thirty-five minute and a half long instrumental tracks is okay, but the ending theme isn't even included on the CD. Fans of the TV series will love seeing the back story being fleshed out, but non-fans are going to be left out on the true value of this movie. For anyone that watches the show, go out and pick up this movie, for you will not be disappointed. If you're an anime fan that just wants to grab a good movie, but you haven't seen Inu-Yasha, then don't start the series here.